Ben Walker rides Genius Contende to top spot. Picture courtesy of www.hoofprintsphotos.co.uk. 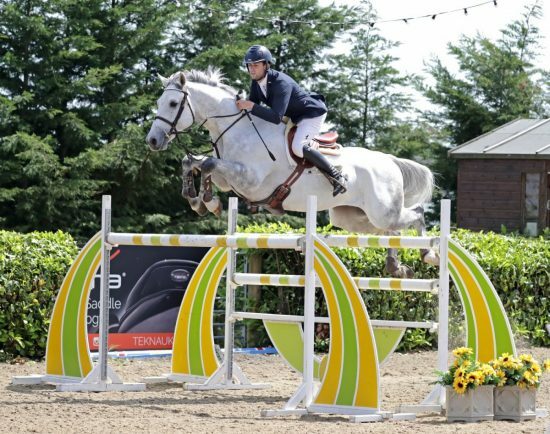 LEAMINGTON rider Ben Walker came first at the Equitop Myoplast Senior Foxhunter Second Round at The College Equestrian Centre in Bedfordshire. Walker was a cut above the rest of the competitors as he secured top spot with the only treble clear of the class. With two direct qualifying tickets on offer for the Equitop Myoplast Senior Foxhunter Championship Final at Horse of the Year Show in October, each of the 52 starters were looking to produce a treble clear. The technical course saw poles fall during the first two rounds, leaving just five competitors to go forward to the final jump-off. Walker rode three solid rounds on-board Genius Contender, a seven-year-old grey gelding owned by Brendon Stud for first place. With the first two rounds offering plenty of challenges, Walker kept his focus to jump yet another clear in the final jump-off in just 45.91 seconds.